This site isn’t just about guns…it’s about liberty. And sometimes, especially on this day, the anniversary of D-Day, we should take a moment to remember that freedom has rarely been given and has mostly been won. I shiver to think that a mere 70 years since so many gave so much for the liberation of a foreign land, that we find ourselves on the precipice of losing our liberty through apathy and acquiescence. Corrupt government agencies targeting American citizens to disagree with policy. Over reaching big brother agencies trampling on civil rights. The executive branch, backed by billionaires, seeking to undermine our last refuge of resistance. The line must be drawn here…no further. In honor of those who have come before us in order to ensure our freedom, strengthened by their courage and heartened by their valor and borne by their memory, let us continue to stand for the ideals for which they lived and died. 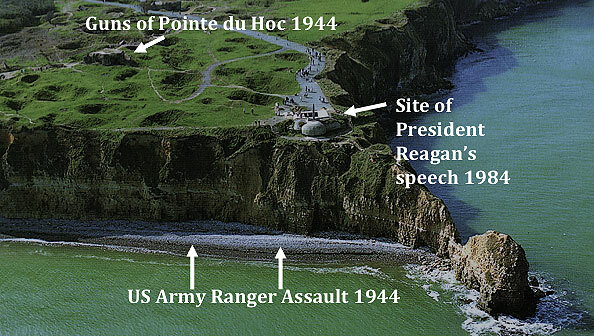 Below is the speech delivered on June 6th, 1984 by President Reagan at Pointe Du Hoc. In my opinion, one of the best speeches ever given by a President. It’s a bit of a read, but if you have the time, it is well worth it. We’re here to mark that day in history when the Allied armies joined in battle to reclaim this continent to liberty. For four long years, much of Europe had been under a terrible shadow. Free nations had fallen, Jews cried out in the camps, millions cried out for liberation. Europe was enslaved and the world prayed for its rescue. Here, in Normandy, the rescue began. Here, the Allies stood and fought against tyranny, in a giant undertaking unparalleled in human history. I think I know what you may be thinking right now — thinking “we were just part of a bigger effort; everyone was brave that day.” Well everyone was. Do you remember the story of Bill Millin of the 51st Highlanders? Forty years ago today, British troops were pinned down near a bridge, waiting desperately for help. Suddenly, they heard the sound of bagpipes, and some thought they were dreaming. Well, they weren’t. They looked up and saw Bill Millin with his bagpipes, leading the reinforcements and ignoring the smack of the bullets into the ground around him. Lord Lovat was with him — Lord Lovat of Scotland, who calmly announced when he got to the bridge, “Sorry, I’m a few minutes late,” as if he’d been delayed by a traffic jam, when in truth he’d just come from the bloody fighting on Sword Beach, which he and his men had just taken. All of these men were part of a roll call of honor with names that spoke of a pride as bright as the colors they bore; The Royal Winnipeg Rifles, Poland’s 24th Lancers, the Royal Scots’ Fusiliers, the Screaming Eagles, the Yeomen of England’s armored divisions, the forces of Free France, the Coast Guard’s “Matchbox Fleet,” and you, the American Rangers.